There are two comic-related two Brighton Festival graphic events this week on Wednesday evening, at the Brighton Dome Studio Theatre, put on in association with Myriad Editions. When is a graphic novel not a comic? When it's a... starts at 8.00pm and features Nye Wright (Things to Do in a Retirement Home Trailer Park; Sprout's Book Club), Hannah Berry (Britten & Brulightly; Adamtine), and Woodrow Phoenix (Rumble Strip; Nelson) - plus special guest, Woodrow's giant book, She Lives. The debate will be curated by Tim Pilcher (mentor of the comic ALT-Brighton). A panel debate at the Brighton Festival exploring the dimensions of narrative art. "The graphic novel as a literary form is really coming into its own at the moment, and we're very lucky that we have one of the best graphic novel publishers here in Brighton – Myriad – so we're putting on an event with them that I'm very excited about" says Mathew Clayton, Literary Programmer, Brighton Festival. 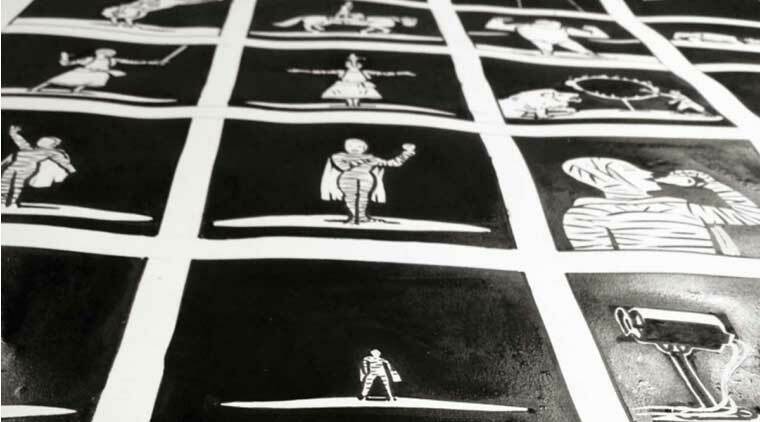 Woodrow Phoenix produced a giant comic for his MA at Brighton University, exploring – literally – the dimensions of what a comic is. Co-winner of Best Book in the British Comics Awards, he and fellow graphic novelists Nye Wright and Hannah Berry debate the different ways of creating narratives: whether pen and paper, ceramics, embroidery or sculpture. Art schools are now hot-beds of new cartoonists, and the traditional US comic is giving way to a more modern, domestic graphic memoir. How did this sea-change come about? What makes a comic, when does it become a graphic novel, is it all just marketing? A panel debate at the Brighton Festival, chaired by comics guru Tim Pilcher and in association with Myriad Editions. Laydeez Do Comics at Brighton Festival starts at 9.00pm - or as soon as they can start. This is a free event in the Studio Bar, in association with Myriad Editions, and featuring the artists, authors and organisers of Laydeez Do Comics, Nicola Streeten and Sarah Lightman, with guests: illustrator and manga artist Chie Kutsuwada and artist curator Kim Pace. Taking place after the panel event in the Studio Theatre, the audience is invited to join the legendary Laydeez Do Comics, the UK’s first women led graphic novel forum – get along and have your eyes opened to some of the amazing work going on in the comics world. Laydeez Do Comics regularly attracts more than 100 guests at its monthly meetings in London, and groups have now set up in Chicago, San Francisco, Bristol and Leeds with pop-ups in New York - and now, for the very first time, Brighton! Nicola Streeten's first graphic book, Billy, Me & You, was published by Myriad in October 2011. It first appeared in serialised form in Liquorice Magazine. Sarah Lightman's first graphic book The Book of Sarah will be published by Myriad Editions in 2015.